When you bite into a Millionaire Shortbread Bar it's like enjoying both a cookie and a candy bar at the same time. It has three delicious layers; a buttery shortbread, creamy caramel, and a shiny layer of dark chocolate. To me, it tastes remarkably like a Twix candy bar. The caramel seems to take center stage, which is probably why these bars are also called Caramel Squares, Caramel Shortbreads, and a Caramel Slice. As its' name implies, this confection starts with a baked shortbread base, which is then topped with a layer of creamy caramel. The caramel is made by heating a can of sweetened condensed milk until it turns into a wonderfully thick caramel. Sweetened condensed milk is made from a mixture of whole milk and sugar that has had about 60 percent of its water removed. Its consistency is thick and sticky (like honey) and it is very sweet tasting. While some recipe call for heating the milk right in the can, this kinda scares me. So what I like to do is to pour the milk into a covered heatproof bowl, and cook it (about 60 to 90 minutes) over a saucepan of simmering water. Quite simple actually. The finishing touch is a delectable layer of dark chocolate. While you could use milk chocolate, my preference is to use either a semi-sweet or bittersweet chocolate as I like how these chocolates temper the sweetness of the caramel. I add a little butter when I melt the chocolate to keep the chocolate shiny, even when refrigerated. 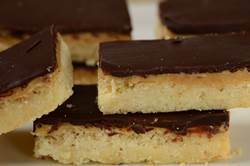 Once the melted chocolate is poured over the caramel layer and has been left to set, cut the shortbread into bars with a sharp knife. Do this before the chocolate gets too hard as cold chocolate tends to shatter into small pieces. If you can resist I find it best to make these bars at least a day before serving to give the flavors time to soften and mingle. Millionaire Shortbread Bars: Preheat oven to 350 degrees F (180 degrees C) and place rack in center of oven. Line a 9 inch (23 cm) square pan with aluminum foil and butter the foil. Shortbread: In the bowl of your electric mixer, or with a hand mixer, beat the butter and sugar until light and fluffy. Beat in the vanilla extract. Add the flour and salt and beat until the batter just starts to clump together. Press onto the bottom of your prepared pan, lightly prick the shortbread with the tines of a fork, and bake for about 20 minutes, or until pale golden in color. Remove from oven and place on a wire rack to cool while you make the filling. Caramel Filling: Pour the sweetened condensed milk into a heatproof bowl and place over a saucepan of simmering water. Cover with a piece of aluminum foil and cook, stirring occasionally, for about 60 to 90 minutes or until the milk has become thick and a lovely caramel color. Remove from heat and beat until smooth. Evenly spread the caramel over the cooled shortbread, cover, and refrigerate for about 30 minutes or until firm. Note: You can also cook the milk in your microwave oven. Place the sweetened condensed milk in a large microwaveable bowl and cook on medium power for about 4 minutes, stirring halfway through baking time. Reduce the powder to medium-low and continue to cook for another 8 to 12 minutes, or until the milk has thicken and has turned a caramel color. Remove from microwave and beat until smooth. Chocolate Glaze: Melt the chocolate and butter in a heatproof bowl set over a saucepan of simmering water. Let cool to room temperature. Then evenly spread the melted chocolate over the caramel and leave to set (can place in the refrigerator for about 10-15 minutes). Cut the shortbread into pieces using a sharp knife. The shortbread can be stored in the refrigerator for about a week. Serve cold or at room temperature. These bars can also be frozen.